New battle lines have been drawn between the judges and the prosecutor in The Hague over methods to speed up trials as the deadline for completion of the tribunal’s work looms. In separate addresses to the United Nations Security Council this week, the president of the tribunal Fausto Pocar and the Chief Prosecutor Carla Del Ponte, agreed on the need for urgent measures to enable the tribunal to substantially streamline judicial processes. But amendments to the tribunal’s rules adopted at a plenary session of the judges just a few days before the report to the UN was due, which give them the right to direct the prosecution to select which counts of the indictment should be taken to trial, have drawn direct fire from the prosecutor. 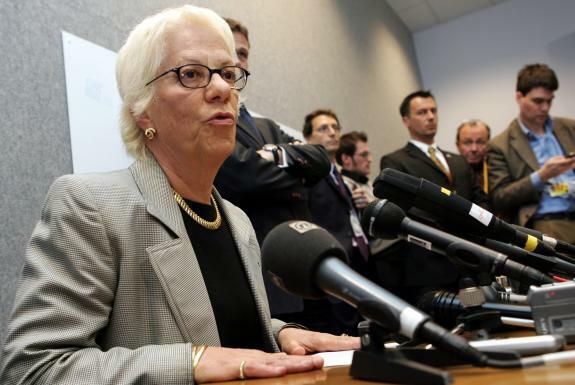 Del Ponte vehemently challenged the new rule as a challenge to her independent authority [read here]. She said it would be “impossible to arbitrarily cut and slice cases”, and suggested it would lead to “impunity for certain crimes”. She said she would interpret the changes as “purely advisory”. The proposed rule change has been welcomed by some legal experts. Michael Scharf, former state department attorney and professor of law in Ohio, has consistently criticised the prosecution for including too many charges against individuals. “[The tribunal] is not a truth commission,” he told IWPR, saying it shouldn’t be trying to provide a “detailed account of everything” that occurred. The prosecution should only file indictments for the most serious crimes where the evidence is strongest, he says. “These ‘exemplary charges’ will provide ‘snapshots of evil’…sufficient for the objectives of international justice,” said Scharf. Edgar Chen, who observed trials in The Hague for the Coalition for International Justice, points out that judges already have considerable powers. They can confirm an indictment; dismiss counts after evidence has been presented, and decide on the basis of relevance what evidence they need to hear – all of which, he says, “bolster judicial economy”. But the prosecution, he says, have to keep other audiences in mind too when drawing up indictments - “the victims, [and those] in the region who do want to see accountability for a vast array of alleged crimes”. Anton Nikiforov, spokesperson for the prosecutor, explained to IWPR that the prosecution did not expect that the new amendments would affect two big multi-accused indictments in the high profile cases about to begin in the next few weeks. They include nine high-ranking Bosnian Serb officers charged with genocide in connection with the 1995 massacre of around 8,000 boys and men at Srebrenica, and a case against seven high-ranking Serb politicians and officers in relation to mass deportations and killings in Kosovo in 1999, both of which will begin in July. But he pointed out that if cuts were requested in smaller cases, for instance that senior Croat generals, which are still to be scheduled, for example, the court could appear “unbalanced” to observers. The counts are often “complex and interlinked” he explained, which would make is very difficult to disentangle them. He also pointed out that it may be perceived as unfair to those who have already been processed by the court. Nikiforov said the only recourse available to the prosecutor would be to appeal. But, he acknowledged, the appeals chamber is run by Judge Pocar, who announced the rule change. Apart from restricting the counts on the indictment, the judges have also decided on a number of steps to control proceedings at the tribunal more tightly, “shifting away from party-driven process to one that is closely managed by the judges of the tribunal”, as Pocar explained. The innovations mainly focus on the work of pre-trial judges, and how they should write strict timetables, require the prosecution and defence to provide timely pre-trial briefs, disclose witnesses and make “greater use of the power to sanction” either side. Chen says that the measures Pocar is discussing, and the various suggestions made by Del Ponte in her speech all point to the “daunting crush of the ‘completion strategy’ [that all organs of the court feel] in their work”. Del Ponte also used her report and speech to the Security Council to attack the cooperation offered to her office by Serbia, Republika Srpska, Russia and the United Nations Mission in Kosovo, UNMIK. As usual, her criticism of Belgrade focussed on efforts to detain the indicted former head of the Bosnian Serb army, Ratko Mladic. She complained that rather than arresting Mladic, the Serbian authorities had wasted time trying to get him to surrender voluntarily. And while a series of operations targeting his support network earlier this year might have succeeded in producing a lot of column inches, she added, they lacked the discretion needed to acquire information that could have led to his arrest. In addition, Del Ponte voiced suspicion that inconsistencies in reports submitted to her office by the Serbian authorities were a sign that the information in them had been “doctored for political reasons”. Del Ponte admitted that she had seen no “credible information” about the location of Radovan Karadzic, the former president of Republika Srpska, also indicted on charges of genocide, “for more than a year now”. But she pointed her finger at the RS, saying that “part of his network …remains there”, and she complained about a decrease in cooperation. Following the successful referendum on independence in Montenegro, the prosecutor said that there was a risk that “problems will arise” with cooperation with the tribunal because state union organs are responsible for that area. Some of Del Ponte’s most scathing criticism, however, was reserved for UNMIK, who she accused in her report of deliberately obstructing access to evidence. “My office has nowadays more difficulties to access documents belonging to UNMIK than in any other place in the former Yugoslavia,” she told the Security Council. Her report also noted that UNMIK had been negligent in its handling of witnesses on a number of occasions, leading to a loss of confidence in the ability of the system to protect them. And it complained of a perception in Kosovo - “justified by numerous facts” - that The Hague’s highest profile Kosovo Albanian indictee, Ramush Haradinaj, enjoys UNMIK’s support. Haradinaj was prime minister of Kosovo prior to his transfer to the Hague tribunal last year. UNMIK has praised his work in that past and backed his successful bid to return to Kosovo and re-enter politics whilst awaiting trial on war crimes charges. In a press release issued the day after Del Ponte’s speech before the Security Council, UNMIK declared her accusations “unfounded”. The statement said that judges at the tribunal had rejected allegations of inappropriate behaviour by the UN administration in Kosovo in relation to Haradinaj. She reiterated that plans to close the Hague tribunal within a few years cannot go ahead unless the two men have faced trial. Following Del Ponte’s speech, Russian delegate Vitaly Churkin dismissed her criticism of his government and described her talk of securing the power to arrest fugitives herself as “fantasies”. Janet Anderson is IWPR’s programme manager in The Hague and Michael Farquhar is an IWPR reporter in London.